"Recently, we’ve seen some comments from our players that feel they are not performing well in Ranked Play compared to others, or disappointed by the fact that they haven’t hit Legend rank. We’re here to let you know that you’re actually doing better than you think!," Blizzard said on the Hearthstone website. They provided a chart that breaks down the player population by Rank. It seems that 75% of players are somewhere between Rank 25 and Rank 15. This is because of the vast amount of people who either A) don't bother with Ranked Play at all, or B) climb to Rank 20 for the new Season's card back and then stop. Progress begins to slow at Rank 20 because past that point, players will go backwards in rank for losing matches. Players who managed to bulldoze their way to Rank 20 won't be able to go any further if they don't learn how to win consistently. Blizzard says that getting to 15 is even an impressive achievement. 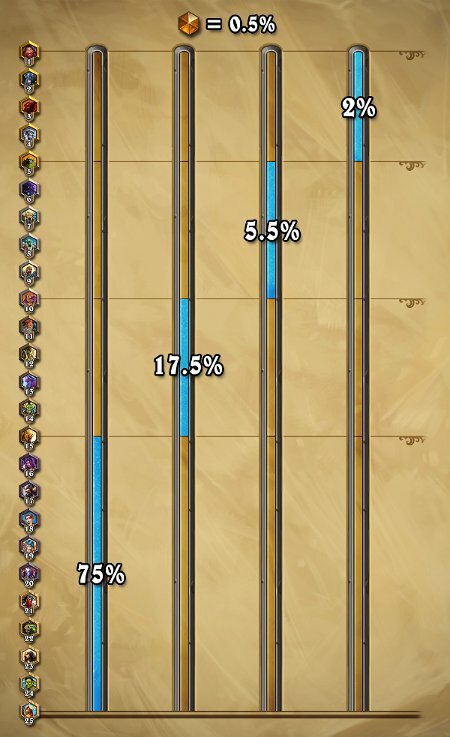 Of the 25% of players between Rank 15 and Legend, the majority (17.5%) are between 15 and 10. Ranks 10 and 5 encompass about 5.5% of players. Only 2% of players get beyond Rank 5. "Climbing the ladder takes a certain amount of skill and dedication, and these players are constantly honing their skills and learning how to combat all of the different types of decks and strategies that are out there. There’s a lot of growth, learning, trial and error that happens between Rank 15 and Rank 1." Blizzard says that only .5% of Hearthstone's player base manages to hit Legend rank. The studio announced earlier this week that there are 20 million players worldwide so that means there are roughly 100,000 Legend Rank players. If you're still gunning for Legend, you may have an opportunity to make some progress soon. A new balance patch coming in a few days will nerf two popular cards in the game. Maybe these changes will remove you a few annoying decks from your path to victory? Should you decide to make a push toward Legend, be sure to check out this helpful advice about the grind. That article doesn't tell you what specific deck to play but does include some tips on how to learn from your mistakes and how to deal with the stress of higher level competition. Hearthstone is currently in the middle of Season 6 of Ranked Play. Players who reach Rank 20 will earn a pirate-themed card back. The back is presumably a reference to National Talk Like A Pirate Day, which happens to be today.